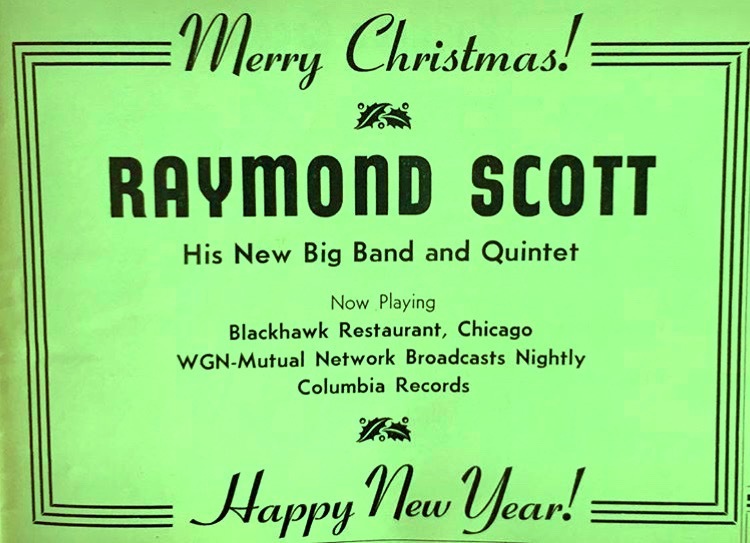 & Happy New Year from Raymond Scott!" From Bugs Bunny, to Ren & Stimpy, and The Simpsons, Raymond Scott's music has a long history with animation. 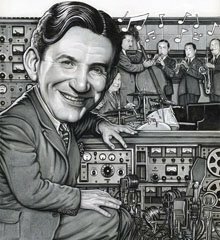 But now the Nickelodeon TV show 'Harvey Beaks' will be the first series to utilize the electronic music of Raymond Scott. Composer Ego Plum, who scores 'Harvey Beaks', has just completed "Missing Harvey," featuring Scott's mid-1960s title, "In The Hall Of The Mountain Queen." The vintage recording is heard, and the tune recurs throughout the new episode with original stylistic rearrangements conjured by Plum. "Missing Harvey" premiers on December 27th, 2017, at 8:30 PM on Nicktoons. Ego Plum preformed a live version of "In The Hall Of The Mountain Queen" at the Redcat theater in Walt Disney Concert Hall — a show we plan to stage again in September of 2018 to celebrate Raymond Scott's 110th Birthday — stay 'tooned. We have small quantities of the much-celebrated and beautifully-designed deluxe vinyl figurine and CD set made by Presspop in Japan for only $39. (+ shipping). They are brand-new. 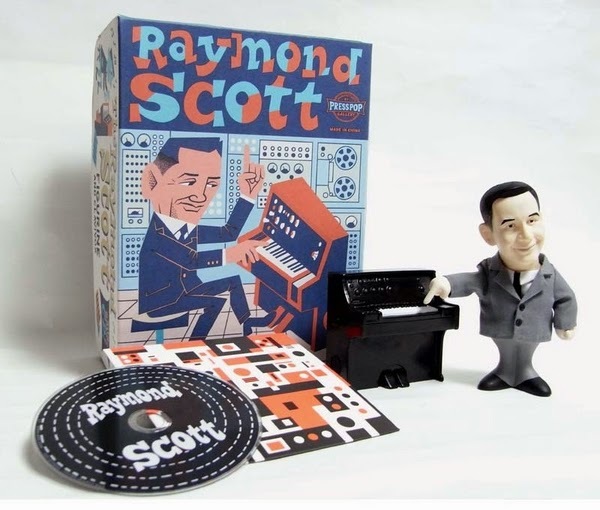 The limited-edition package features a miniature replica of Raymond Scott's patented 1950s keyboard synthesizer, The Clavivox, and a CD featuring rare tracks from the Scott Archives, produced and compiled by Jeff Winner (me). 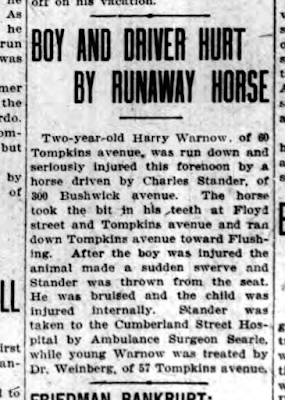 Front-page item (below the fold) in the Brooklyn Standard, July 16, 1910. Harry recovered and went to engineering school and a career in music. No word on the conditions of Mr. Stander or his errant horse. "further confirmation of Scott's singular genius"
This critical assessment by Marc Medwin (Dusted magazine) of the new Raymond Scott electronica set, Three Willow Park, isn't just the best review of the package—it's the best TEN reviews. Unlike many of his contemporaries who churn out assembly-line reviews by cutting-and-pasting passages from press releases, Medwin practices old-fashioned music journalism. That takes time, because it requires the writer to actually LISTEN to the music being reviewed. There is something romantic about Scott's quirky visions, something slightly humorous in the sounds often squeaking and brapping from his devices, as if nothing could be taken completely seriously at all times. 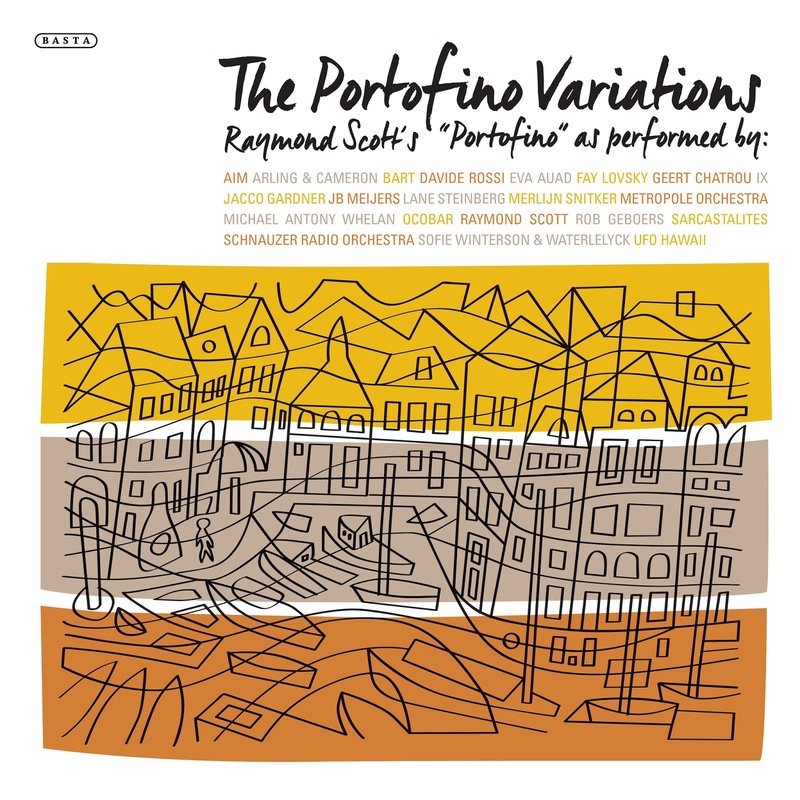 Revel in the electro-acoustically saccharine “Portofino 3,” in which high-register women’s voices and saxophone pepper the electronic ripples and arpeggios. 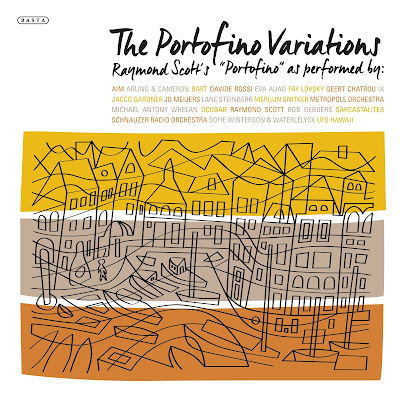 This whimsy even applies to his own corpus, as heard in the completely reworked and daffy version of “Toy Trumpet” from 1966, complementing the longer one that can be heard on Manhattan Research Inc. It’s Scott’s most well-known melody, but it’s given a complete makeover, as Miles Davis might have done with “So What” or Chick Corea did with “Spain.” Then, there are the positively zany sounds taken from the effects reel for Jim Henson’s 1966 film “The Organized Mind,” whose soundtrack is heard complete on MRI. Hearing the sounds divorced from context, like little misshapen galaxies, is instructive and a bit unnerving, a few jump-cut and smile-inducing moments notwithstanding. It’s all very far removed from the “serious” worlds of Stockhausen, Berio and the weighty concepts they imagined and championed. Ultimately, despite its complexities of vision and execution, there’s something endearing, almost childlike, in Scott’s music, something wondrous, sparking the imagination to travel paths similar to the trails its creator blazed. Medwin brings lots of knowledge to his criticism.—he's an assistant professor in the music program at American University's College of Arts & Sciences, and wrote his dissertation on the late works of John Coltrane. 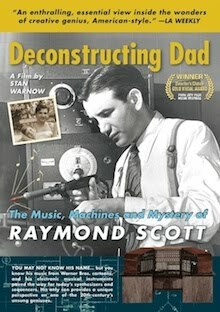 Layne Weiss recently wrote a fine article for the L.A. Weekly about Raymond Scott's electronic music years. The online version can be read at "Can Synthesizers Compose Music? Nearly 50 Years Ago, This One Could." Weiss conducted many interviews, and editorial space invariably limits each respondent to a few choice quotes. Last week we posted the full interview with Irwin Chusid, the co-producer of Three Willow Park, the new 3-LP/2-CD collection of vintage, previously unissued Scott electronica. This week we offer the complete interview with Three Willow Park Associate Producer Jeff Winner (who also co-produced Manhattan Research Inc., 3WP's Scott electronica predecessor). Layne Weiss: When and where did Raymond Scott develop his Electronium? Jeff Winner: Raymond had been developing Electroniums out of the public eye throughout the 1950s. He moved to L.A. in 1971. He was nearing his mid-60s, had lived his life in New York, and was willing to make a major transition at that stage. He had his third wife, Mitzi, and this was like a whole new start. It ended up being his final professional gig because his health declined during the period. LW: How long did he work before his health started declining? JW: He started having heart trouble much earlier—in the 1950s. 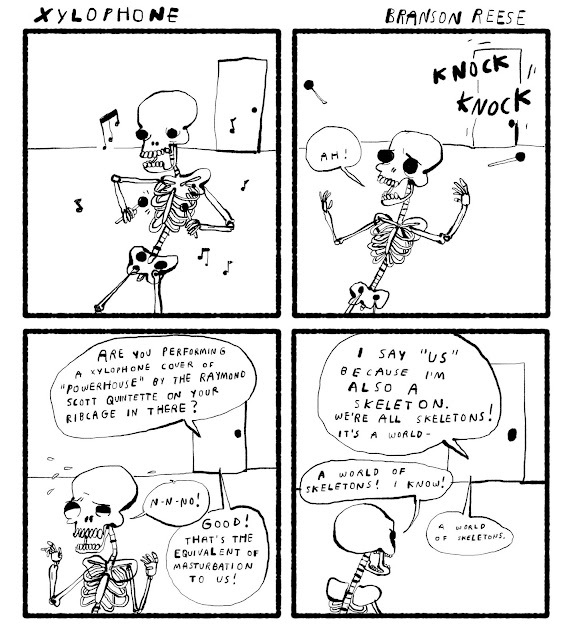 Later he had a stroke and heart attacks. The span of his Motown tenure was about 7 or 8 years from the time he started working for them under contract on Long Island, through moving west and getting a full-time position with Motown. They retired him around 1977 because of his health. LW: When did he start working for Motown and how did he transition to L.A.? JW: In 1969 he started to publicize the Electronium. In 1970, Motown owner Berry Gordy and his entourage arrived at Scott's Three Willow Park facility in Farmingdale, Long Island, to see a demonstration of what was, at the time, Scott's state-of-the-art Electronium. Gordy was so impressed that he said, “Here’s a check for $10,000 to get started and build one for me.” That one that you see in the color photograph with the beautiful wooden cabinet—that’s the one Raymond made specifically for Motown. When Gordy ordered the Motown Electronium, he stipulated that it was his exclusive thing. Raymond was not allowed to publicize the deal. He couldn’t even put out a press release declaring that he was employed by Motown. Gordy did not want word to leak out that hits were being generated by robots. Raymond was disappointed about that. LW: When did all this info start coming out? JW: It was known prior to Scott's death but hadn’t been explored in detail. We’ve made attempts over the years to reach Gordy for comment, but we’ve received only polite declines. Hopefully someday that will change. We would love to know how he looks back on it now. LW: How did the other Motown artists react or warm up to Scott being there? JW: Some of the studio musicians — when they attempted to play along with the machine, they didn’t like it. They resented being told to play to a click-track. Musicians rely upon their own internal metronomes, their own sense of rhythm—and these guys were amazing instrumentalists. For them to be asked to subordinate their talent to a machine, to let the machine be a leader, some resented that. On the other hand, Michael Jackson was fascinated by the Electronium and wanted to use it. He thought it was the future. And he was right. Others? We don’t know. We don’t have any evidence. But we know they were all working at the same facility and we presume that everybody was at least given the opportunity to utilize the technologies that they were bringing in. This all goes to a broader wave of technology. Motown had the best recording equipment. As a new decade was dawning, there was buzz about this new thing called a "synthesizer." In 1970 Bob Moog introduced the Minimoog to the consumer market. Now you had a mobile synth. It could go from city to city on tour for the first time. That was the year when the revolution really coalesced in terms of technology, availability, price and mobility. It’s probably not a coincidence that Gordy was so turned-on by the Electronium at the same time. LW: Do you have any examples of artists that weren’t thrilled by working with Scott or his Electronium. JW: Hoby Cook, an engineer, was assigned to record session musicians playing along with the Electronium. He provided an interesting chronicle of the musicians rebelling against the experiment. We don’t know of any high-profile names who were not into it. People have speculated that Stevie Wonder would be a logical candidate to use it because he loves synthesizers. I don’t think he was a great prospect. For one thing, he’s blind and probably couldn't operate it. Second, the main purpose of the Electronium was to come up with its own bass-line, grooves, melodies, and rhythms. The last thing Stevie Wonder needed was help generating musical ideas. ABOVE: Berry Gordy in Motown studio, 1960s. LW: Scott was not very sociable and he created a lot of his devices so he wouldn’t have to deal with people. What was it like for him having to meet people and demonstrate how this stuff worked? JW: He was fine with that — as long as there was something technical as a conduit. He was probably in his element at Motown. He respected them, and they respected him. They were fascinated by the technology and he was the grand wizard who was trying to give them the keys to the future. He taught studio staff at Motown how to help musicians use the device, so he wouldn't have to keep doing it. He was happier in that later stage of life because he was doing what he really wanted to do. He explained that in a letter to a fan in 1980. He said it was the most enjoyable time of his life, working with electronic instruments and electronic music. LW: Do you know how his family felt about relocating? JW: Mitzi, his third wife, loved him tremendously and she would have done anything he wanted. It was a lot of work for her because he was so busy — it fell on her to return to Three Willow Park to close down the facility. He had tons of equipment, and tape reels, and she had to sell some of it. Some stuff got thrown away and the rest of it she had transported to L.A. They rented a furnished apartment while Gordy and Raymond worked at Gordy’s house. He had an amazing estate in Bel-Air. They set up a laboratory above the garage, and then it all got moved to the Motown facility. Mitzi and Raymond eventually settled in Van Nuys. After Raymond passed in 1994, Mitzi moved to Santa Clarita. Raymond stayed in California for the rest of his life. He loved the weather and taking long drives through the mountains and near the coast. LW: Was he star-struck at all? JW: Not at all. He'd been a celebrity since he was young. He wrote his first hit tune at age 25. His older brother was a CBS radio star before he was. He rubbed elbows with everybody from Sinatra and Crosby to Smoky Robinson, Michael Jackson and Diana Ross. He collaborated with Jim Henson. He was part of the 20th century entertainment industry. There were artists he admired, but the idea of him, say, asking for an autograph seems unfathomable. He was a celebrity himself, but he didn’t go out and party with other stars. He was a recluse who focused on work. LW: Were Raymond and Gordy friends or was it just professional? JW: They got along great. Raymond was at his house from 9 to 5 every day. They were close the first couple of years. 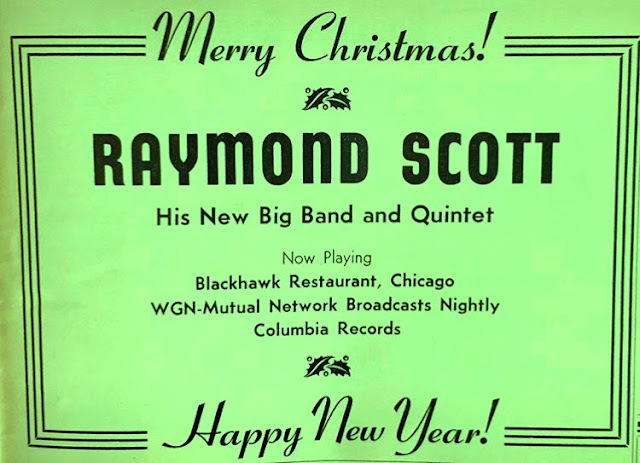 Gordy was aware of Scott's early career as a hit-maker, starting in the 1930s. Gordy was aware that he was getting not just a technological wizard, but a guy who knew how to compose hit tunes. And of course Scott was aware of Gordy’s amazing accomplishments. In the 1960s Motown was unstoppable. They dominated the pop charts. Even in the ‘70s they continued to be potent with the Jackson 5, Diana Ross, Stevie Wonder, Earth, Wind & Fire, and Marvin Gaye. LW: How about some info on the new album, 'Three Willow Park'? JW: This is the first time the public will be hearing the Motown Electronium. The span of the recordings is from 1961 to 1971, so there’s material that pre-dates the Motown Electronium, when Raymond was still living in Manhasset, New York, in a giant 32-room mansion, with then-wife Dorothy Collins. There’s material from #3 Willow Park after he moved there in 1965. And there's some material from the early part of his Motown tenure in L.A. through 1971. So the 1970-’71 recordings feature the Motown Electronium. All prior recordings with the Electronium feature earlier versions of the device. It’s a progression in terms of chronology — from the material on Manhattan Research Inc. to Three Willow Park. The non-working Motown Electronium was purchased in 1996, a couple of years after Scott passed away, by Mark Mothersbaugh of Devo. He’s also a successful film composer. He's done Wes Anderson movies and Disney projects, such as The Lego Movie. Mark kept the Electronium in his L.A. studio for a long time. It was moved to Portland for restoration. It’s now coming back to L.A. because a new restoration attempt is being undertaken by Brian Kehew. Among many other roles, he’s a keyboard tech for The Who. He’s working with Wally de Backer (a.k.a. Gotye), who’s providing financial assistance. 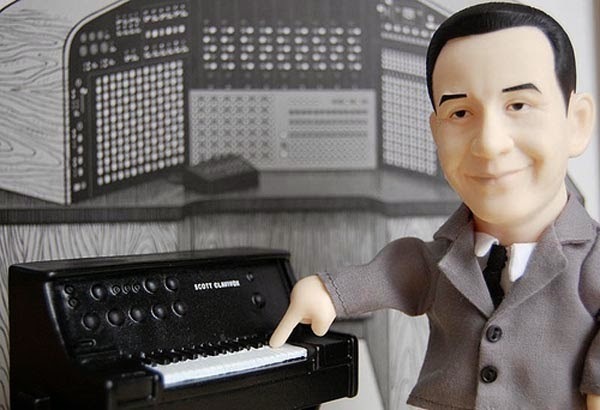 Layne Weiss recently wrote a fine article for the L.A. Weekly about Raymond Scott's electronic music years. The print version, genuflecting to Thomas Edison, bears the clever title "The Wizard of Willow Park." The original online title, "In the '70s, Motown Hired a Synth Wizard to Build Them a Songwriting Machine," was later changed to "Can Synthesizers Compose Music? Nearly 50 Years Ago, This One Could." 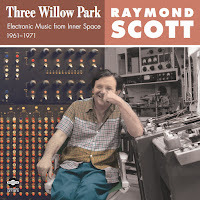 Weiss interviewed me two months before the release of Three Willow Park, the new 3-LP/2-CD collection of vintage, previously unissued Scott electronica, which I co-produced with Gert-Jan Blom (with Jeff Winner as Associate Producer). Weiss conducted many interviews, and editorial space invariably limits each respondent to a few choice quotes. Below are the full replies I sent to Weiss, provided here for additional background on the development of Three Willow Park. Layne Weiss: Why is now the time to release this project? Irwin Chusid: Because we finally finished it. The followup to Manhattan Research Inc. (released in 2000) was long overdue, but for a number of reasons, was repeatedly postponed. The additional time made it a better project because we were able to collect more material and construct a more detailed chronicle about Scott’s years at Three Willow Park Center. LW: What should listeners expect as far as sounds, music, and content, and why is this release special for Raymond's family, you, Gert-Jan, Jeff, and for music fans in general? IC: It’s different than MRI. 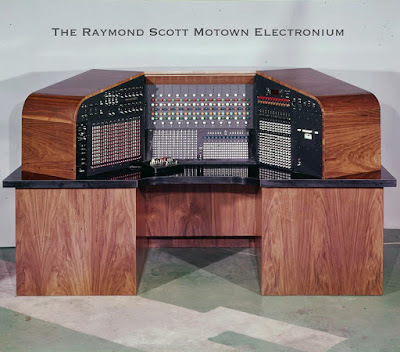 For one thing, it features the sounds made on Scott's Motown-era Electronium, which was the "Mark 2," refined version. There was no "Mo-tronium" on MRI. An earlier, less-refined incarnation was featured. 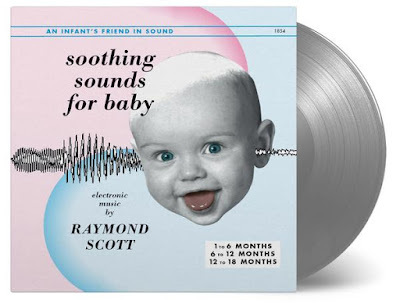 That album also included dozens of early TV and radio commercials with electronic music and effects soundtracks. There are no commercials on 3WP, although there are a handful of sound effects from ads. 3WP features a wide array of music and sounds. Some are accessible and pleasant. Others will peel layers off your cerebral cortex. We tried to program the tracks for constant surprises. Everything we used we consider listenable. There's something for everyone, but we can’t guarantee that everyone will enjoy it all. The moods range from relaxing to brutal. LW: Can you explain the significance of the title? Maybe give some insight on Raymond's life at Three Willow Park or just explain what it was and why it's so important. IC: Number 3 Willow Park Center was a large rental bunker in an industrial development in Farmingdale, New York. Built in the early 1960s, Willow Park Center was a patch of suburban real estate where corporations based headquarters, small companies leased office space, and manufacturers kept warehouses. 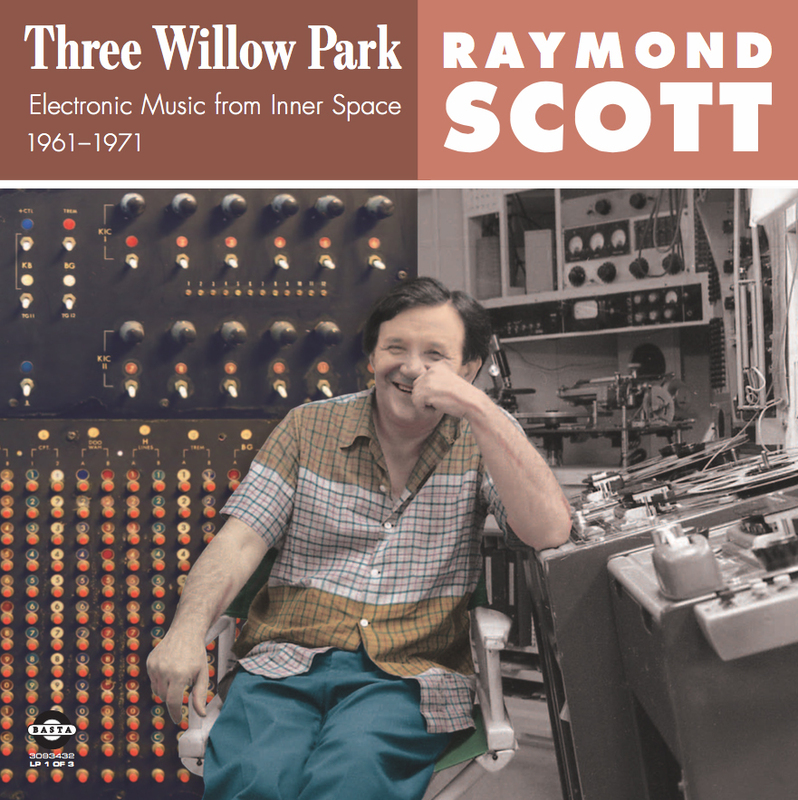 Sometime after the summer 1964 demise of his marriage to singer Dorothy Collins, Scott moved to Willow Park to set up his electronic music lab. When I say "moved," I mean "moved in." He lived there. Residential occupancy wasn't legal under local zoning regulations, but Scott paid his rent and outfoxed the lease police. It was at Three Willow Park that he built the Electronium. He was living there when he met and married his third wife, Mitzi—who besides cooking his meals, kept his books and learned how to solder circuitry. She’s an important part of the story, and there’s a photo of her on the back of the LP set. This makeshift compound remained Scott's atelier and bedroom until around 1971, after which Raymond and Mitzi decamped for Los Angeles, where he went to work for Berry Gordy at MoWest. 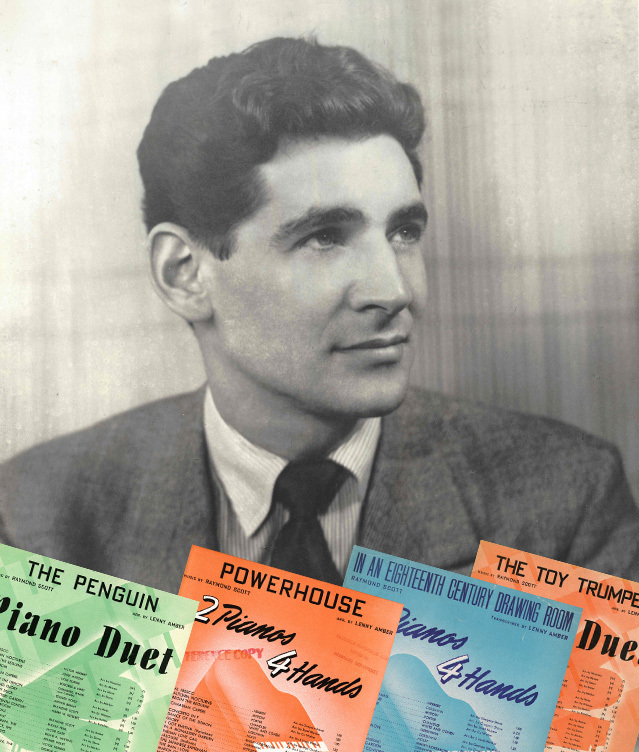 LW: Why did you choose these particular ten years of music (1961-1971) to have on the album? IC: It's a nice, tidy decade. The earliest tracks we considered date from 1961. Anything earlier was on MRI, whose oldest track dates from 1953. The recordings on 3WP end at 1971, because in 1972 Scott went to work for Motown. Gordy hired him to develop the Electronium—which composed by itself using programmed intelligence—as an "idea generator." In particular, the Electronium was great at improvising complex melodies and rhythms. While Scott was employed there he was under a strict gag order. Motown contractually prohibited him from publicizing the nature of his employment. They were worried that their fans might think that Motown’s instrumental stylings were being performed by “Mo-bots.” As far as we know, the Electronium was never used on any Motown recordings, but we know that a young Michael Jackson would occasionally drop in Scott’s on-site studio to watch the device work. We don't have a direct quote, but someone who worked there with Scott said Jackson was quite excited by the machine's possibilities. LW: Has this music been previously unheard by the public? How do you feel about releasing it? IC: 98% of the music on 3WP has never been publicly circulated, altho a few pieces have been played on the radio or previewed for inquiring journalists. LW: Where will people be able to buy it? IC: Anywhere fine music is sold. We have expressly forbid it to be sold where bad music is purveyed. 3WP will be available as a 3-LP set, 2-CD package, and digital. 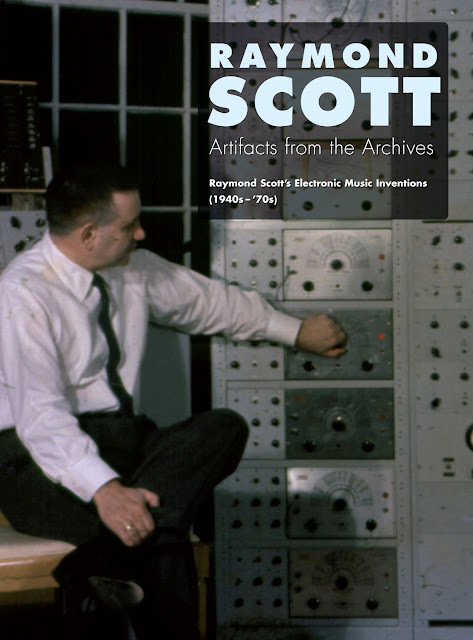 We will also offer a free 349-page downloadable pdf consisting of documents, photos, and ephemera chronicling Scott’s career in electronic music and engineering. 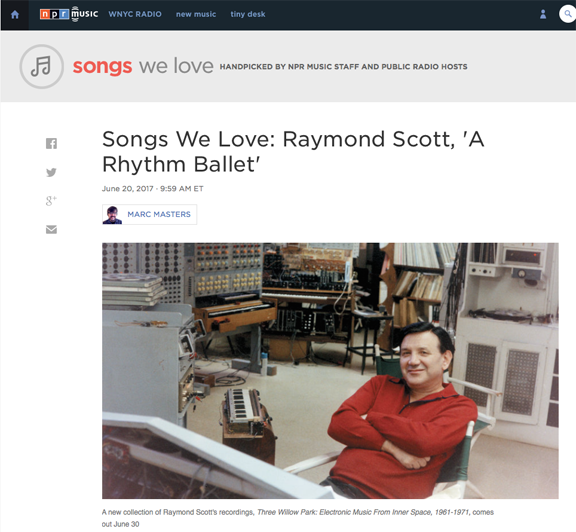 NPR's "Songs We Love" premieres "A Rhythm Ballet," a track from the forthcoming Raymond Scott electronica album, Three Willow Park: Electronic Music from Inner Space, 1961–1971. 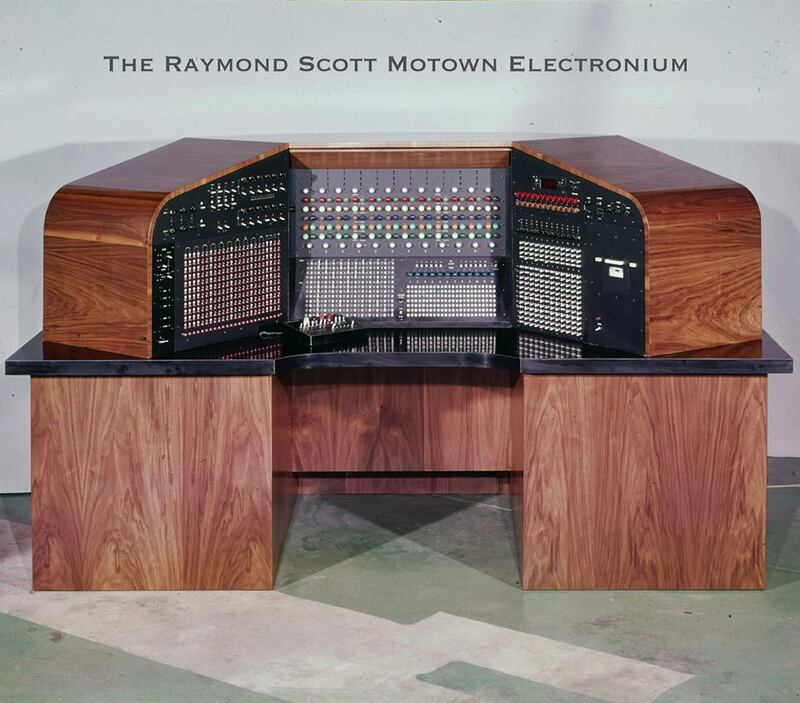 The track is "performed" by Scott's Electronium—the "Mark II" version he built for Berry Gordy of Motown. Three Willow Park will be issued on June 30, on Basta. 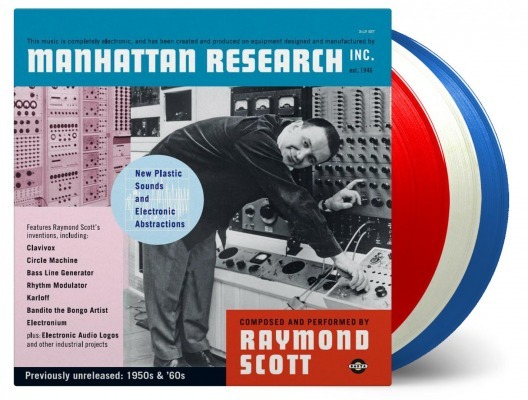 We are offering a FREE 349-page pdf compendium of Raymond Scott artifacts and ephemera, including previously uncirculated historic material. The contents of Artifacts from the Archives are intended as informational supplements to the Scott albums Three Willow Park, Manhattan Research Inc., and Soothing Sounds for Baby. 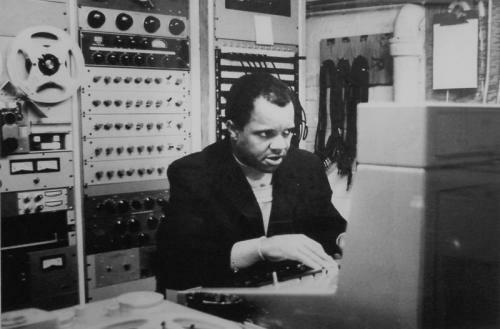 The chronological, annotated documents and images spotlight Scott’s career in the field of electronic music, from his 1920s Brooklyn high school days to his 1980s post-Motown years in Los Angeles. Much of the content focuses on Scott’s most productive period, from 1958 (when he began working on electronic music full-time) to 1972 (his first year at Motown). The collection features Scott’s handwritten and typed technical notes, photographs, sketches, correspondence, art, schematics, patents, circuit diagrams, vintage news articles, and family ephemera. The pdf is offered for download in two formats: high resolution (for viewing and printing), and reduced resolution, suitable for paging through on-screen.